About the only thing Jay Kleberg and Dee Margo have in common is the R next their names on the primary ballot — that and their desire to take on freshman Democratic state Rep. Joe Moody in November. 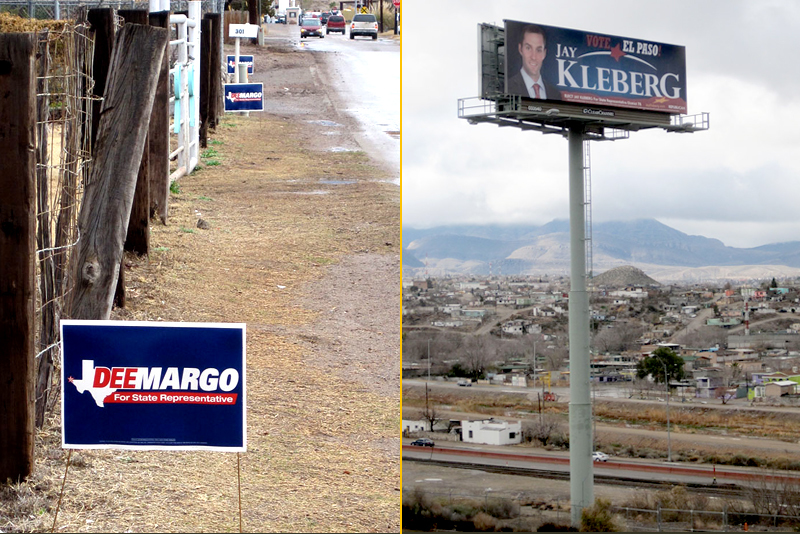 About the only thing Jay Kleberg and Dee Margo have in common is the R next to their names on the ballot. The two are competing to represent El Paso’s affluent Westside and its working-class Northeast in the Texas House and reclaim a legislative seat for the GOP. Kleberg, 32, is a young father, a corporate business recruiter and an amateur triathlete. He speaks about El Paso and the campaign — his first run for public office — with such zeal that he sometimes asks a campaign staffer if it's too much. “We need somebody with a fire in their belly,” Kleberg says. Margo, 58, has two grown sons, runs an insurance company and is a former college footballer. This campaign is his third try for a seat in the Legislature, and he has the talking points down to a fine science, easily answering a reporter's questions with the most direct route to ending the interview. “I just want to take the experience I’ve garnered over the last 30 years … and apply it to our benefit,” Margo says. A third candidate, L. Rene Diaz, a former bank branch manager, is also running in the GOP primary but is not expected to be competitive in the race. Margo, CEO and chairman of JDW Insurance, has been trying to bring his Republican leadership to the Capitol since 2006. That year, he ran for the Texas Senate against Democratic incumbent Eliot Shapleigh. Margo lost with 41 percent to Shapleigh’s 59 percent despite a well-financed campaign subsidized, in part, with his own money. Margo attributed that loss to El Paso Democrats’ propensity for straight-ticket voting. So in 2008, Margo made a run for the city’s only Republican-dominated area. HD-78 is diverse — home to pockets of wealth near the El Paso and Coronado Country Clubs, regions of intense poverty in rural Canutillo, and neighborhoods near Fort Bliss where Army veterans have settled — and has been trending more Democratic in recent years. The 2008 Republican primary between Margo and Haggerty was a nasty campaign in which each candidate spent close to $1 million to see which could call the other a worse name. Haggerty’s mother even got in on the act in a commercial spoofing Margo's then-recent move into the district with the line, "I have a carton of milk that's been in the district longer than he has." Margo won the brawl with 57 percent of the primary vote. This campaign, he says, has been less about personalities than the 2008 primary. Neither candidate has launched negative television commercials. In his radio ad, Margo touts his conservatism, vowing to oppose tax increases and fight Washington mandates. Because he’s already familiar to many voters, he hasn’t spent a lot of time and money on new campaign materials. His small yard signs — the same ones he used two years ago — dot a few yards and small businesses, mostly in the affluent area where he lives near El Paso Country Club. His website differs little from the 2008 version, and a birthday fundraiser invitation he sent out was identical to one he used previously except for the event date. “There are only so many ways you can have voter contact,” Margo says. With his 30 years in El Paso rearing a family, running a business, raising money for charities and working with city leaders to bring jobs and military growth to the city, Margo argues that his experience dwarfs that of his young opponent. He boasts of his relationships with Republican leaders like Gov. Rick Perry and Lt. Gov. David Dewhurst. During two public forums last week, he told the audience about a call he made to GOP Comptroller Susan Combs to check in on state revenue. “I can be effective from day one in Austin,” Margo says. 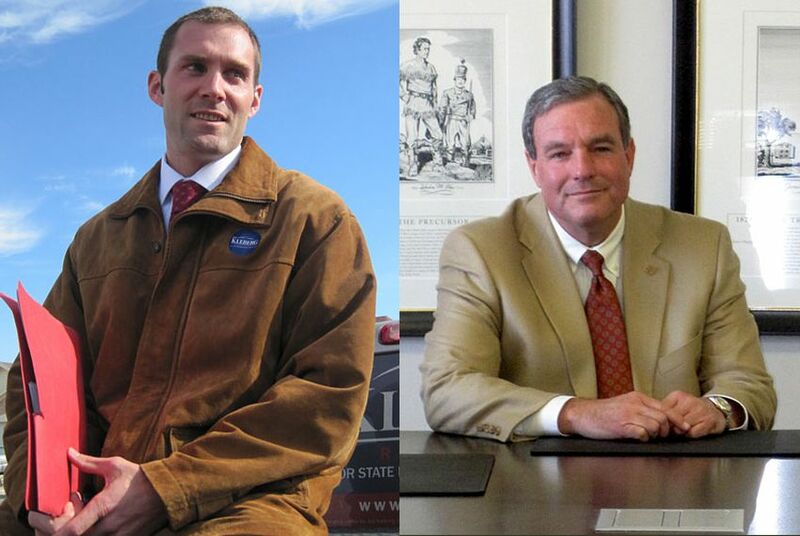 It's Kleberg's first bid for public office, and he has run the race like an endurance test. He started putting up signs and knocking on doors before Christmas, keeping a steady pace that he says has led him to about 2,000 El Paso doors. His blue campaign signs, large and small, are all over the district, and he purchased a giant billboard alongside Interstate 10 near downtown. As the week before early voting drew to a close, Kleberg was getting ready to launch his final kick of the race, planning to release TV and radio commercials and amp up the door-to-door campaign. And like many endurance athletes, he was limping to the finish line, literally, on a sprained ankle he turned in an early morning basketball game. “I think we’re doing everything we can,” he said. Kleberg, who grew up in South Texas on his family’s famed King Ranch, moved to El Paso in 2004 after spending more than three years working for a conservation and tourism company in Brazil. He worked for Verde Realty until November, when he announced his plans to run for office. In the relatively short time he's lived in El Paso, he says, he’s become smitten with the city, which is why he decided to run. “I just felt like there was so much opportunity that wasn’t, in my opinion, being fully represented and promoted at the state level,” he says. If he's elected to the House, Kleberg says he will "promote the hell out of the city." He says he wants other lawmakers to invest in El Paso’s future by putting dollars into local projects such as the new Texas Tech University medical school. During public forums and at voters’ doors, he says his top priorities would be bolstering education, reducing property taxes and improving the quality of life in El Paso. Those goals, he says, require long-term solutions. “It’s going to take another 10 to 15 years to realize the fruits of our labor, so we need young, energetic, determined, hungry leadership that’s willing to get right in and work and listen,” he says.